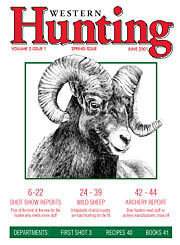 The world's 1st electronically distributed multi-media hunting magazine! Distributed free via the Internet. RealPlayer G2 or greater recommended for multi-media features. Pick of the best of the new for the hunter who needs more stuff. Inhabitants of wild country are hard hunting for the fit. Bow hunters need stuff so archery manufacturers show off. Invite a friend to subscribe!